Latest of several biographies of the British comic novelist, written by the editor of his letters and sanctioned by his son, the novelist Martin Amis. 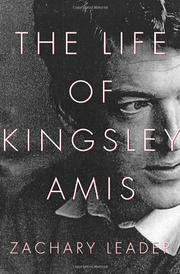 This capacious, cluttered life of big-living Kingsley Amis (1922–95) emphasizes the craftsmanship of his fiction and the importance of his frequently overlooked poetry. Leader (English Literature/Roehampton Univ., London) aims to show “what it was like to meet Amis and to be him.” The facts don’t differ from those documented by Eric Jacobs in Kingsley Amis (1995) and Richard Bradford in Lucky Him (2001). Amis’s father was an office worker; the family lived in a drab London suburb. Kingsley attended City of London School and in 1940 went up to Oxford, where he formed seminal friendships with Philip Larkin and “The Seven,” who all loved jazz and wrote poetry influenced by Auden. He served in the Royal Signals Corps, then returned to Oxford and took up with art student Hilary Bardwell. Hilly got pregnant, and they got married in 1948, shortly after Amis’s first book of poetry, Bright November, appeared. A legacy from Hilly’s mother allowed the growing family to live comfortably while Kingsley lectured in English at University College of Swansea. Aided by Larkin’s critical suggestions, Lucky Jim emerged in 1954 and made Amis’s reputation. That Uncertain Feeling, I Like It Here, Take a Girl Like You and other succeeding novels increased his fame and added him to the ranks of the Angry Young Men, a label he repudiated. He’d always been an inveterate drinker and philanderer, but his more serious affair with Jane Howard prompted Hilly to break up the marriage in 1963. (Leader takes care to show Amis’s tenderness toward his children.) Moving from documentary realism into such genre efforts as Colonel Sun and The Green Man, the increasingly dissolute and aggressively self-interested author never lost his literary powers; The Old Devils won the Booker in 1986. A fastidious effort to portray the mighty Kingsley in his full glory.